Oklahoma Community Resources | McIntyre Law, P.C. McIntyre Law takes great pride in being part of the Oklahoma community. Whether you’re a Cowboys fan or a Sooners fan, or you live in Tulsa or the Panhandle, we all have a lot to be proud of as Oklahomans. As a personal injury law firm, we are dedicated to helping our neighbors throughout the Oklahoma community through our practice specialties, community service projects, as well as infographics and studies. In that same vein, we’ve compiled these Oklahoma Community Resources for you. We are always looking for ways both small and large to give back, and it’s our hope you’ll find these resources useful. Thank you for being part of our community! Does Car Technology Help or Hinder? In a commitment to make Oklahoma roads safer, and to improve the lives of our fellow Oklahomans, McIntyre Law has been researching drunk driving trends in the state of Oklahoma for the past five years. We all know that driving and alcohol don’t mix, but we take a deeper look at the specific trends behind alcohol related crashes. For example, do you know how your county stacks up against other Oklahoma counties with respect to alcohol-related fatalities? 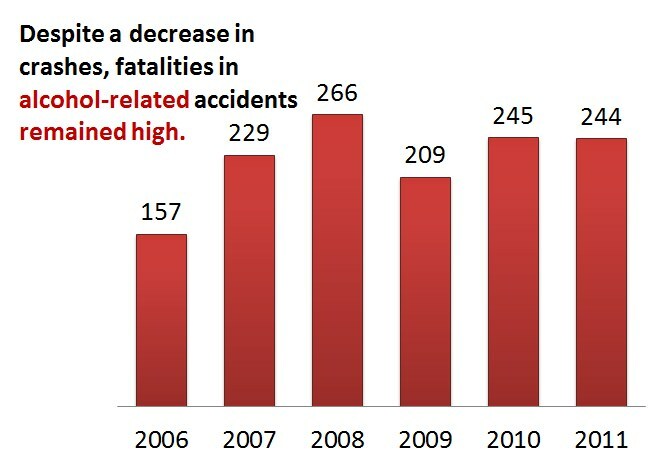 What about what percent of alcohol-related fatalities occur on dark roads, as opposed to during daylight? By bringing this knowledge to the public, we hope to see a further decline of DUIs and alcohol related fatalities in Oklahoma in the coming years. Learn more about trends in Oklahoma drunk driving, and our work with the annual Oklahoma DUI Report.